The earliest record of a mill at Hopwood dates from 1570. Parish Register entries from 1611 to 1731 imply that the miller resided at the mill. It is therefore possible that a millers house existed at least as early as 1611. 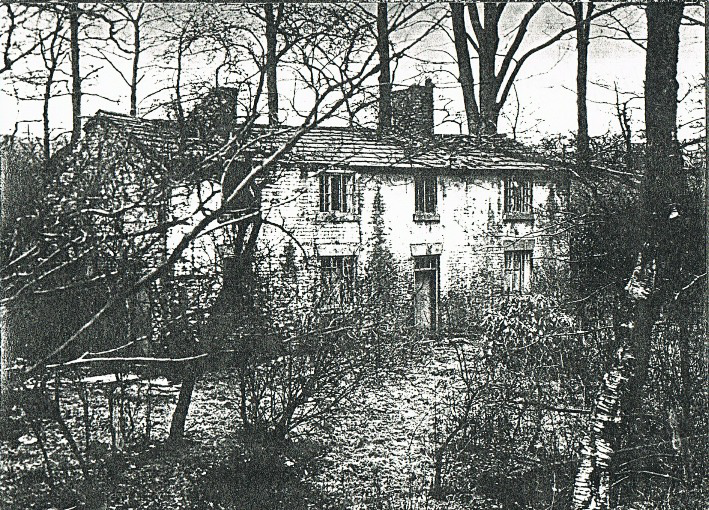 The earliest documented reference specifically mentioning the house is in a 1781-2 survey of Hopwood.1 It seems likely that it is this building which is shown on the Tithe Map of 1840 and subsequent Ordnance Survey maps until the middle of the 20th century. Although larger than the two bay building described in the survey the cottage may have been extended. A photograph thought to be of the house shows a double fronted house of two floors with what might be a workers cottage attached to the eastern end. It is uncertain when the Hopwood Mill closed. William Kershaw is recorded as a corn miller residing at Hopwood Mill in the 1841 and 1851 census.. In 1861 James Statter is the miller and the 1871 census records William Swindles as Corn Miller at Hopwood Mill but there is no census entry for the millers house in 1881 indicating that the house was unoccupied at that time. The mill had certainly closed by 1890. It is described as disused on the OS 6 inch map of 1894 (surveyed 1889-1890). The 1891 cenus shows the Mill House occupied by William Ellis a gardener and in 19018 by John Wood also a gardener. By 1901 the cottage seems has been renamed as the Gardeners Cottage and was occupied by James Strudwick a general labourer, his wife and two domestic gardeners. By 1911 it is known as the Bothy Cottage and was occupied by the Bailey family who remained there until it was demolished in about 1947. During 2019 Robert Huddart is publishing a series of updates on the investigation of the Millers cottage.